Your roof is built to protect you from the elements. A well-maintained roof can stand up to wind, rain, and the intense heat of summer with no problems. But occasionally a storm comes through that is so powerful that it may overwhelm your roof’s ability to withstand the elements. In that case, your roof can be damaged by the storm. Once a roof is damaged, it loses its ability to protect you even from less harsh elements. That’s why it is so important that you learn how to find hidden storm damage on your roof. Identifying and repairing storm damage quickly after it occurs will save your roof from further damage. Preventing further damage isn’t just a good way to protect your home. It can also save you thousands of dollars on more extensive repairs or even a full roof replacement. After a storm, you may want to get up on your roof and do a full inspection. After all, you are a responsible homeowner and want to take every measure you can to protect your largest investment. But before you go scrambling up on your roof, take a moment to think about your safety. Especially after a storm, your roof can be slick and slippery. Even when the ground has dried, a roof can remain dangerous. If even a small amount of algae or mold has taken hold, it can be like black ice, hard to see but extremely slippery. Also, if there has been any impact damage from falling debris, the structure of your roof could be compromised. A large branch that hits your roof may leave only a little visible damage. But if the decking beneath the shingles is cracked, one misstep could send you falling through your roof, with harmful results to you and your roof. Sometimes, the best way to protect your roof is to avoid getting up onto it. Instead, there are many ways to uncover hidden damage that don’t require scaling your roof. Once you have exhausted all of these measures, if you suspect your roof could be damaged, call in a professional for a further inspection. Eagle Watch Roofing will do a free inspection of your roof. In addition to the benefit of experience, our roofers use a number of safety measures, including safety harnesses, proper shoes, and other methods you may not have available if you try to go up yourself. So leave it to the pros. Contact Eagle Watch Roofing after a storm, but stay off your roof. One of the best and safest ways to uncover damage to your roof is to look for collateral storm damage away from your roof. If a storm has included hail, look for hail damage on other parts of your home. Check for dents in the siding of your home. If you have an outdoor air conditioning unit, check it for impact marks. It is often easiest to spot hail damage on metal surfaces. If you have a deck, check the wood (or composite or other material) for pockmarks left by large, intense hail. You can also check lawn furniture or any other outdoor structures you have. If you find signs of hail damage in any of these places, it is likely your roof has some hail damage, too. Hail damage to a roof can be hard to spot and requires close inspection, so that is best left to a professional. After a storm with high winds, there may be a good amount of blown and fallen debris. The combination of high winds and large trees that is so common in the Atlanta metro area can be a dangerous mix. We love our trees, but pounding rain and blasting wind can bring down some hefty branches. Look around your property for fallen branches. If you find that a lot of debris is scattered about, there is a good chance that some hit your roof. Of course, if you can see branches on your roof, you can use other methods, like looking from underneath, inside the attic, to assess the seriousness of the damage. You should also check around your property for items that may have been blown around. If you notice lawn furniture or other items that have been blown over or moved, you can get a general sense of how powerful the wind was at its strongest gusts. If everything is settled, chances are your roof did just fine. But if large items have been blown across your yard, you should be thinking about possible wind damage to your roof. It is important to note that the ability of shingles to withstand wind varies greatly. When you purchase shingles, they come with a wind rating that is usually codified in the warranty. If you live in an area prone to high winds, it may make sense to purchase shingles made for high winds. Both these shingles and the nails that hold them are specially designed to stay put in high winds. If you want to go with cheaper shingles, you can forgo the high wind ratings, but be aware that you will have to check for wind damage after any severe storm. 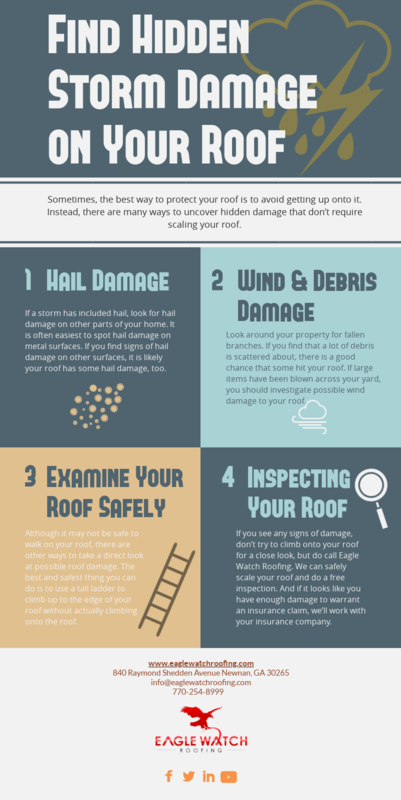 Although it may not be safe to walk on your roof, there are other ways to take a direct look at possible roof damage. The best and safest thing you can do is to use a tall ladder to climb up to the edge of your roof without actually climbing onto the roof. As always, follow safe ladder practices. Make sure the ground, deck, or other material beneath your ladder if flat, even, and dry (that is, not slick or muddy). If you are using a step ladder, place it parallel to your house so you can get as close to the edge of the roof as possible. Never use the top step of a step ladder. Most will have a warning telling you which is the highest step you can safely climb. If you are using an extension ladder, make sure that the base is firmly gripping the ground and the top is well supported by the roof. Never lean an extension ladder directly against a gutter, as most gutters will not support the weight of a ladder with a person on it. Dark spots where hail or falling debris have knocked loose the granules that protect your shingle from the sun, exposing the darker tar paper beneath. Dark lines or cracks across the width of the shingle, parallel to and a couple of inches below the bottom of the shingle above. This may be a sign that the shingle was lifted up by the wind and flapped around, creating a crease in the shingle. Missing, shifted, or obviously torn shingles. Curled shingles, either curling up at the edges or curled upward in the middle to create an arch that leaves space under the middle of the shingle. Large branches or other debris that wasn’t visible from the ground. If you see any of these signs of damage, don’t try to climb onto your roof for a close look, but do call Eagle Watch Roofing. We can safely scale your roof and do a free inspection. And if it looks like you have enough damage to warrant an insurance claim (see this post for more on that), we’ll work with your insurance company. We’re there from start to finish to make sure that your roof is fixed at the lowest possible out of pocket cost, often just your deductible.